The terrain, distant from the bustle of the city, best conveys the beauty and harmony of the native land. 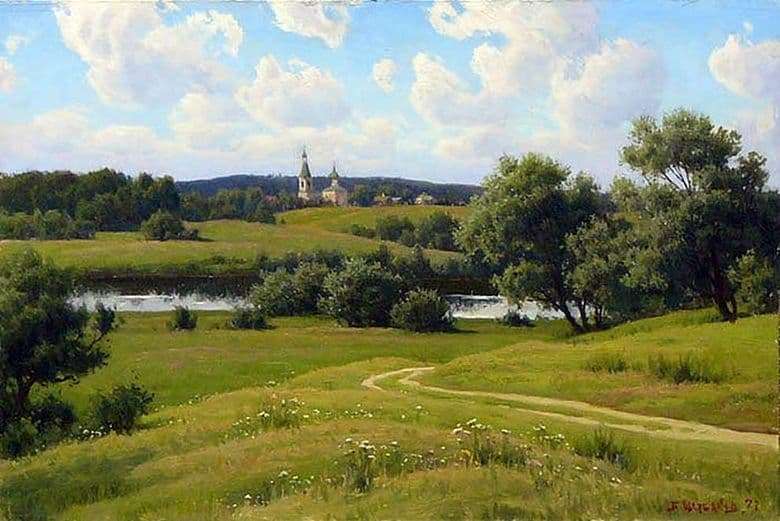 The author chose this particular meadow solely because he saw in it the beauty, the soul of the Russian land. Freshly cut grass is depicted with soft green strokes of various shades. Among the grass one can see a scattering of small white flowers, which do not attract much attention, but harmoniously fit into the overall composition. White flowers give the landscape freshness and tenderness, and yellow, pink and blue blotches bring a variety of colors to the picture. The light grass is cut by a small path that stretches into the distance, to the river. The river is located almost in the very center of the canvas, the smooth surface of the water reflects a clear, clear sky and trees growing near the shore. Clear skies give clear water a bluish tint, and trees contribute to the green color. In the center of the picture there are neat low bushes blocking the most part of the river, along the edges of it some more low bushes and strong trees grow. The farthest bank of the river is framed by the same light mown grass, the texture of which is distinguishable even despite the large distance from the composition in the foreground. There is an overwhelming desire to touch the grass, feel its softness and freshness. On the distant shore one can see a modest little chapel, which is visited by local residents for service. To the right of the church the silhouettes of houses are hardly distinguishable. The horizon of the composition is filled with a forest filled with abundantly growing trees. A clear blue sky with shaggy white clouds conveys the atmosphere of a warm sunny day, peace, harmony and tranquility. The beauty of the native land is subtly conveyed by the master, it trickles out of each component of the landscape, filling the viewer’s heart with love and admiration.